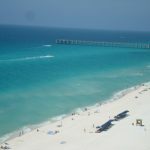 Panama City Beach saw a nearly 20 percent increase during the month of March according to the latest round of bed tax numbers, exceeding expectations. College students on Spring Break were an obvious factor, but tourism officials are also crediting the increase to great weather and a positive marketing spin. Student marketing firm Collegiate Marketing Group (CMG) also played a role in helping market the sun and fun destination commonly referred to as the “Spring Break Capital of the World”. The company oversees the increasingly popular spring break website www.pcbeachspringbreak.com and its many social media spin-offs. The branded website was visited by more than 100,000 unique visitors each during the months of February and March. Its Facebook page alone has more than 72,000 likes, which makes it the most popular Spring Break Facebook fan page in the world. The fact that the north-western Florida destination is easily accessible by car, and now by air as well, is a major factor in the decision planning of a college student.